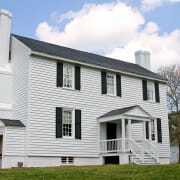 Serve as tour guides, greeting visitors to the historic house museum and giving them a tour of the house. There are also opportunities to assist with educational programs for elementary and middle school students both on-site as well as in a classroom setting. A minimum of two (2) four hour shifts a month is ideal, the time commitment is flexible. Most be comfortable speaking to a variety of audiences. Most be able to learn and retain historic facts and convey these facts to visitors. If facilitating education programs must have skills interacting with and teaching children.